Lemon bars recipe (small batch) for two made in a bread loaf pan. This recipe makes 8 small lemon bars. I’m going on 5 years here in northern California, and I’m getting pretty used to the California lifestyle. I love how every town has a weekly farmer’s market. If you miss market day, there’s always a roadside stand that sells local fruit, vegetables, honey, olives and nuts daily. I love that when the rest of the country was covered in snow and ice a few weeks ago, we were enjoying a sunny 65° (we still are, by the way—don’t be jealous). But my favorite thing about California: CITRUS! This is the time of year when the citrus trees are bursting with fruit. Everyone is sharing bags of oranges, clementines, lemons, Meyer lemons, grapefruit and pomelos from their backyards. I felt like the luckiest Texan alive last week when I received a bag of home-grown Meyer lemons! I made a small batch of lemon bars in my standard 9″ bread loaf pan. <–Here’s a link to the exact pan I use. The recipe uses just 1 lemon, or however many lemons it takes to get 3 tablespoons of juice. It’s packed with lemon zest. My lemon bar recipe is slightly different from other lemon bars. Instead of the standard shortbread crust, mine has a bit more sugar, making it taste like a sugar cookie. I use powdered sugar in the crust to give it a subtle sweetness that still lends itself to being a tender yet crisp crust. One note about this lemon bar recipe: the crust mixture seems overly powdery the first time you make it. You’ll think ‘this needs water or an egg, or something to hold it together!’ But fret not, the crust will hold together after the heat of the oven melts the butter and bakes it. This lemon bar recipe requires two bakes: first, the crust bakes separately. While you’re waiting for the crust to bake, don’t skip ahead and make the lemon filling, ok? Acidic lemon juice and eggs aren’t the best of friends, and it’s a small miracle that curd actually exists in our world. So, let the crust bake on its own; clean the sink, prep for the filling. Only when the crust is golden brown around the edges and fully ready to come out of the oven should you begin making the lemon filling. The lemon filling just requires some steady but not vigorous whisking. 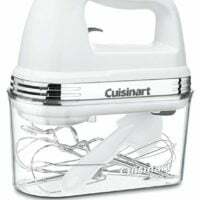 You want to dissolve the flour and baking powder, but if you whisk too much, you’ll make air bubbles in the filling. Air bubbles are okay–we’ll cover them with powdered sugar anyway, but it’s best to try to limit them. 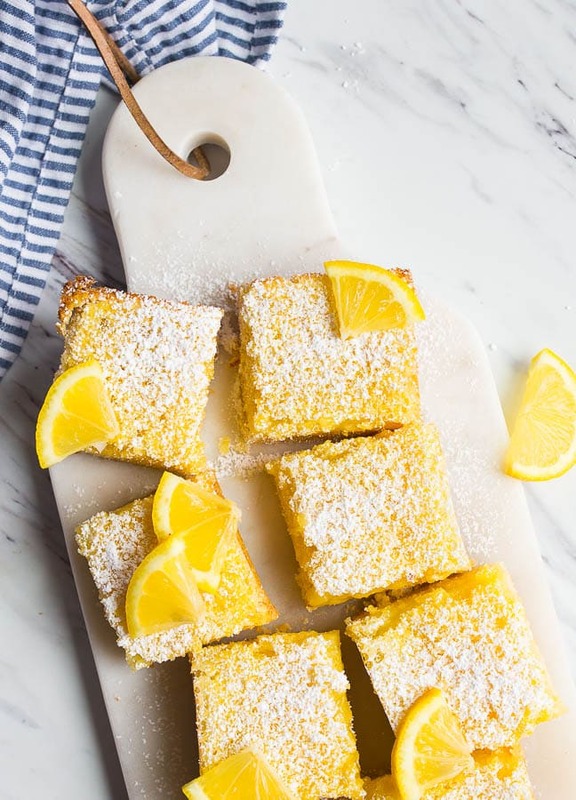 In this case, I use Meyer lemons to make this lemon bars recipe, but regular lemons are completely fine here! If you want to approximate the Meyer lemon flavor, use 2 tablespoons of lemon juice and 1 tablespoon of freshly squeezed orange juice. The floral notes from the orange mimic the unique fragrance of the Meyer lemon. 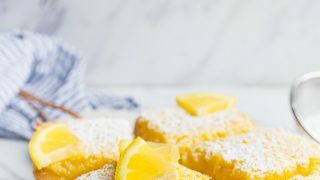 I’m a true lemon lover, and have so many lemon desserts on this site to share with you: Meyer Lemon Scones, Lemon Blueberry Cheesecake, and Lemon Cake for Two are my favorite recipes here on the site. Also, if lemon curd is your jam like it is mine, then you’ve got to try my Microwave Lemon Curd recipe! 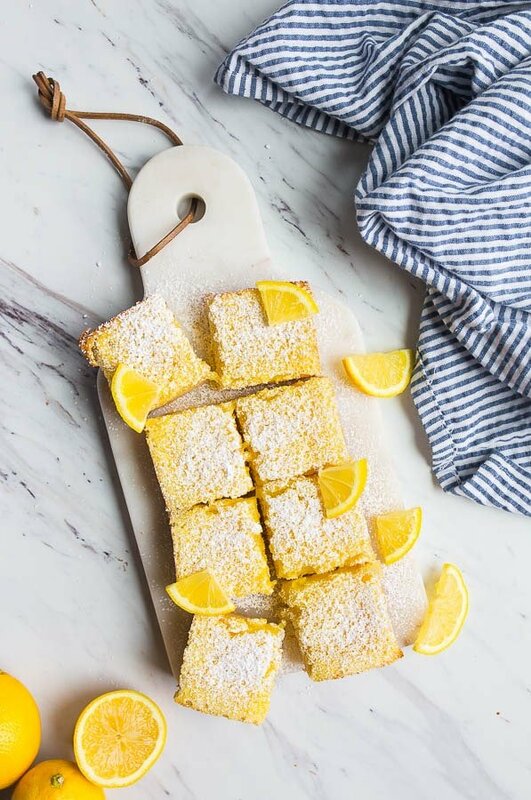 So, if you’re lucky enough to have Meyer lemons, use them here for this lemon bars recipe, but either way, the recipe will be perfect! One final note: this recipe uses one whole egg plus one egg yolk. This means that you’ll have a leftover egg white. Click here to check out my recipes that use egg whites. A small batch of lemon bars made in a bread loaf pan. Preheat the oven to 350°. 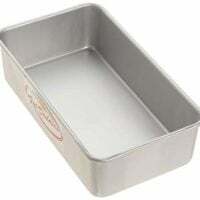 The best pan for these bars is a glass bread loaf pan measuring 9” x 5” x 3”. If you only have a metal loaf pan, line the pan very well with parchment paper. You do not want the acidic lemon curd to touch the sides of the metal pan. First, make the shortbread crust: In a medium bowl, add all crust ingredients. Use your fingers or a pastry blender to rub the butter into the flour, sugar and salt. You should have a coarse meal. Press this mixture into the bottom of the loaf pan firmly. Bake for 25 minutes, or until the edges are slightly browned and the top is not wet to the touch. Once you remove the pan from the oven, you may then start making your filling. (Do not make the filling ahead of time and let it sit---eggs and lemon juice aren't the best of friends). In a small bowl, beat with a hand-held electric mixer the granulated sugar, lemon juice, lemon zest, whole egg and egg yolk. Beat this mixture very well until it becomes frothy--about 1 minute. Beat in the baking powder and flour until no lumps remain. Pour this mixture over the crust that has been cooling. Return the pan to the oven for another 20-23 minutes, or until the filling is set. Immediately remove the bars from the loaf pan and allow to cool before dusting with powdered sugar and cutting into bars. You just made me REALLY want to live in California (although i already kind of did)! I can’t help it, I am so jealous! 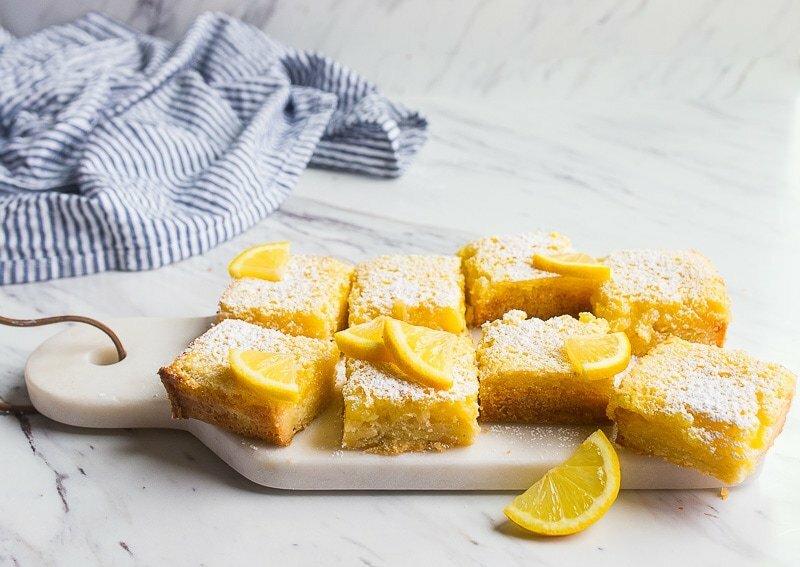 Your lemon bars look just lovely! I have been considering trying to grow a Meyer Lemon tree in a pot, so I could bring it in over the winter. Probably a lost cause in Wyoming! I am so jealous! I’ve never had a Meyer Lemon, and I want to try them SO bad. Even when we were in Texas last week, there was snow. It sucked! At least there was barbecue and mexican food to console me :) The lemon bars look so so good. I want to make them! Your lemon bars look lovely! They look just like my grandmother’s , but I bet the meyer lemons bring them to a whole new level. Yum! wow, love your lemon bars, look so good. They look absolutely delicious! i love lemon bars:) my grandma used to me them all the time! your recipe sounds so good. thank you for sharing this, and have a great weekend. I have never had good luck at Lemon Bars… many times they taste wonderful but don’t look so pretty. Yours look like they fit both bills! I’m from just north of San Francisco, in San Rafael (currently in San Diego, though) and I always loved the fruit stands and markets!! Later, living in Vacaville I worked in Woodland and would drive through fields and fields of corn and sunflowers. I always kick myself for not stopping and taking pictures of those towering flowers. Suuuuure Christina just rub it in a little more! So so jealous that you live in a sunny place AND get to eat delicious citrus. I get so excited when signs of life start happening like flowers blooming so I’d be excited for fruit too. I wish there were more farmers markets around here! I love the sweet/tangyness of lemon bars, I’ll have to try yours out! 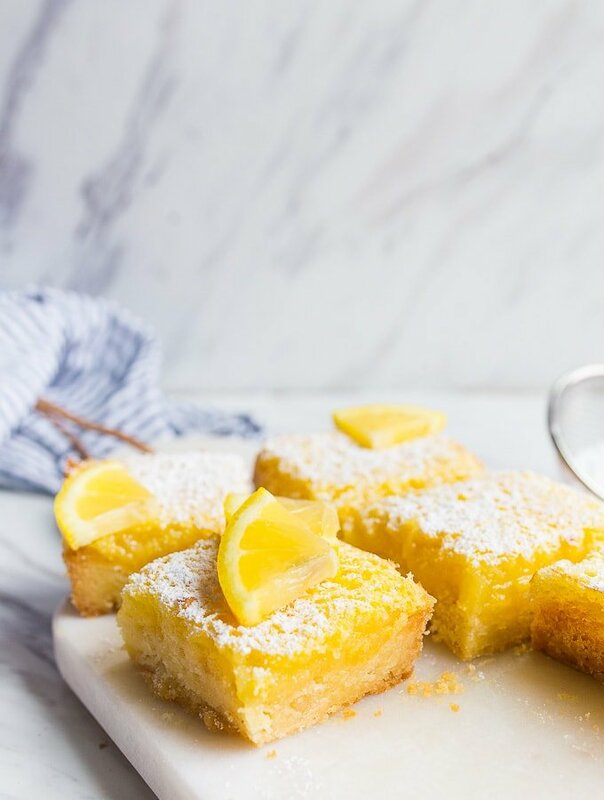 You can never go wrong with lemon bars! They’re one of my favorite things to make in the spring…which I wish would hurry up and get here! I changed this recipe so much I can’t speak to how it would turn out if I had made it as written (although I’m sure it would be wonderful), but I loved my changes so much I had to write in. I really love the combo of lemon and chocolate so I added 3 tbl. of cocoa powder to the shortbread crust, used demura sugar in place of white (I was out) in the filling, and baked 3 sliced strawberries with the filling. These are heavenly! The lemon filling was perfectly tart and sweet, and the recipe has a great ratio between the filling and crust. My normal lemon bar recipe uses less butter in the crust so I didn’t realize how much better the bars would be if I upped the butter. I served them with a hearty topping of fresh whipped cream and they were gone in no time. Thank you for the recipe (and you’re amazing blog)! Wow, Em! Your changes sound absolutely delicious! Thank you SO much for taking the time to write them in so we can all make your version too! You’re a domestic goddess! I made these today. Goodness they were good! I cut them into 8 squares so, I think they could easily be enough for 4 people. I’m loving your blog and scaled down recipes. Thank you SO much! I’ve been a regular follower of your blog and find your recipes are great – and fool-proof! My bf adores my small variants on your blueberry muffins! I actually recently moved to Northern Cali from the midwest and picked up some Meyer lemons at the store today – having never thinking twice about them prior to your blog. I’m excited to give these bars a try! I am always looking for small batch dessert recipes. It’s nice to have something sweet without a tempting amount of leftovers sitting on the counter. Also, these smaller batches are easy to make in my toaster oven. It turned out perfectly! Best of all, I don’t have to turn on my big oven, which makes the house unbearably hot in the summer. They were delicious. My husband and I loved them! Thank you! These are so foolproof. I used organic cane sugar for the filling which changes the colour a bit but turned out fine! I added lemon zest to the crust as well and sprinkled fresh blueberries over the filling before baking. So good! I just made this. It’s delicious! Will make again. Thank you! Wow, and WOW! made these earlier today. My husband is a picky lemon bar eater.. He and I are blown away! And I’ve been told for yrs.that I’m a good home Baker. Hi I’m trying to access your recipe for Meyer lemon bars, but it doesn’t seem to be on your site any longer. I’ve made it several times before, but never printed it, would really like to make it again ??? I’m so sorry, Carol! Let me update that for you right now. Thank you Christina, I’ve made these lemon bars before and they are my husbands favourite. Meyer lemons were on sale this week so I thought it would be the perfect opportunity for this favourite treat. Making them tomorrow! I’ve got these in the oven right now and I’m super excited to try them! I just noticed that the recipe itself says 6 bars and your note at the top says 8. Thought you might want to correct that. Oh yummy Lemon bars . I am from New Zealand we have lemons in our garden most folk here have their own lemon trees, but I do see lemons in Super Markets from the USA cheaper than our own grown ones ! Hi Christine, Really enjoying you smaller desert recipes. I have your first Desert for Two book. I have never made lemon bars in my life, so this is my first go. Are they supposed to look dry on top like cake? I followed your recipe above to the letter. Hope they turn out. My husband loves lemon! Hello Christina, could this recipe be “doubled”, please? Yes, use a 8×8″ pan, lined with parchment paper. THey’ll be a bit thinner than traditional lemon bars, though. But still delicious!